Bruce, a pastor in Zambia, is teaching people how to raise pigs and goats to combat poverty and raise funds for the school sponsored by his church in one of the poorest communities in Lusaka. Project: To help alleviate poverty levels in one of the poorest (third hungriest) nations in the world by educating people on how to raise, market and sell goats and pigs. 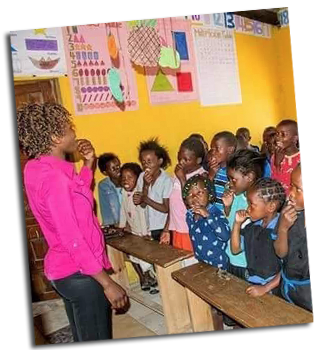 Bruce is pastor of Center of Grace Church, a nondenominational church based in Zambia, Southern Africa, and led the church in establishing the Hesed School, which provides primary school education to 250 students. The vision of the church and the ministry of Hesed is aimed at empowering individuals who earn less than $1 per day. Besides educating people on how to raise, market and sell goats and pigs, this project will help pay for school expenses, such as educational materials. The first phase of the project is to build pens for the goats and pigs, while the second phase is to purchase the animals and initial food for them. The community will contribute labor for constructing the pens and also will provide labor to grow food for the goats and pigs. Bruce’s project has started with 9 goats and should double by the end of 2018. The communities in which Bruce serves are among the most densely populated areas of Zambia and are characterized by high poverty levels. This project will provide women and children needed skills that include accountability, sharing and caring, sustainability and self-reliance, improved animal management, nutrition, education and communication. The goat and pig rearing project has inherent capacity to help quickly transform people’s livelihoods for the better as these animals multiply quickly.